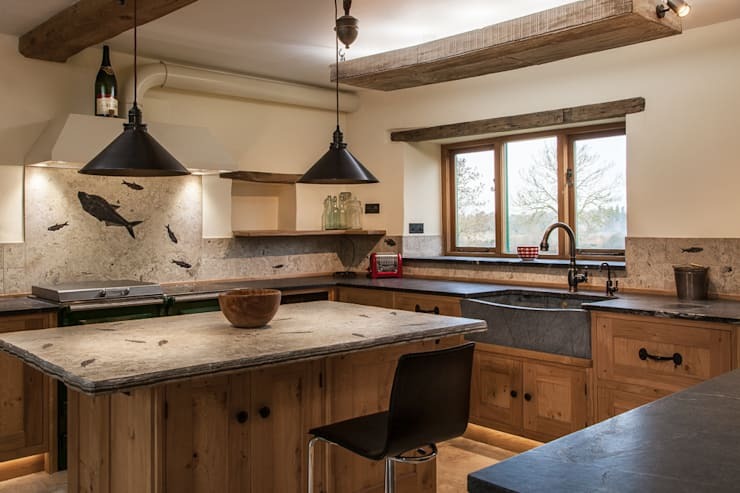 Our brief was to renew the kitchen and utility room in a 17th century barn conversion, constructed from local Ironstone and Oak. 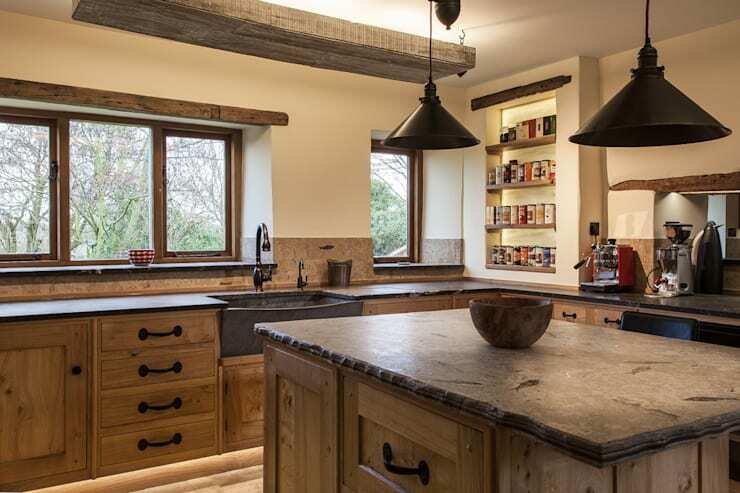 Having built them a stone & oak extension previously at the property, we knew our client had a taste for the unusual but even we were surprised at the materials they wanted us to use. At first nothing was out of the ordinary, we were asked to lay a new solid floor with a wet underfloor heating system, finished with a tumbled limestone tiled floor. They asked for bespoke kitchen units hand crafted from solid oak with a hint of a rustic feel paying homage to the building. Then it started getting just a little strange. 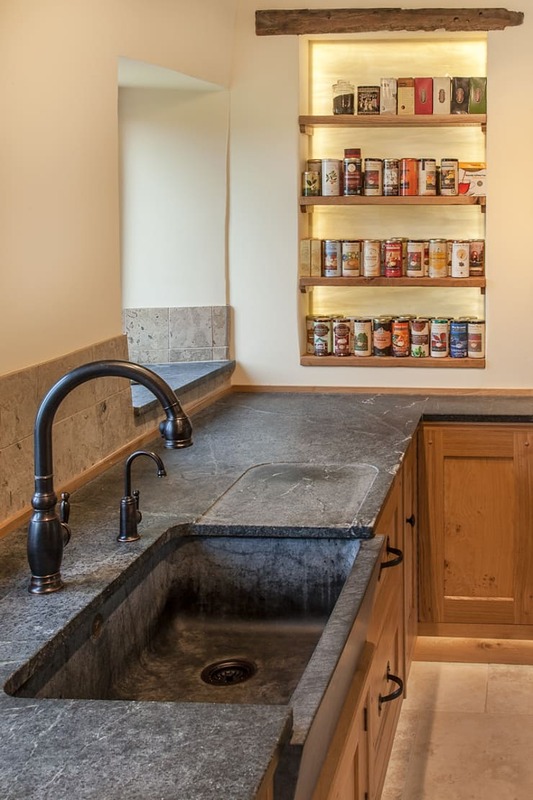 The worktops they wanted were not the ususal granite, marble, or wood. No, it wasn't polished concrete either, what they wanted was Soapstone. 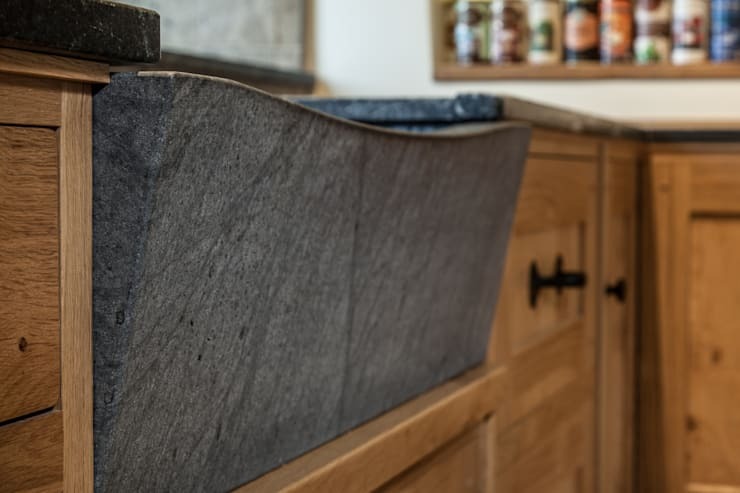 We knew Soapstone worktops had at some time, been installed in UK kitchens and that it is widely used in the USA but there is a reason why it is not a popular choice of material because it is so soft you can almost cut it with a butter knife, a plastic one at that! Bingo, we found 5 slabs of Santa Rita soapstone cut from a quarry in Brazil, that were sitting in a yard somewhere in New York, so we shipped them to the UK. The next item on the agenda were the two sinks. Ceramic Belfast you might think by Villeroy & Boch, or another style from one of the leading manufacturers, no, they didn't want copper, although it was on the list, they wanted Soapstone sinks, each one carved from a solid block of sopastone from… .India. No problem, Scooped, angled, drop fronted sinks it was. Have you ever tried to make taps (faucets), made in the USA, fit British plumbing? We had special fittings made in the UK to make them work. Not finished yet, cabinets, worktops, sinks and floor almost sorted. Now for the Island worktop, it was not going to be Soapstone, nor was the backsplash to the Everhot range cooker, or the wall tiles, or the inset tiles to be set into the Limestone floor. Those elements were to come from just one place on Earth, Wyoming in the state of Utah, USA. 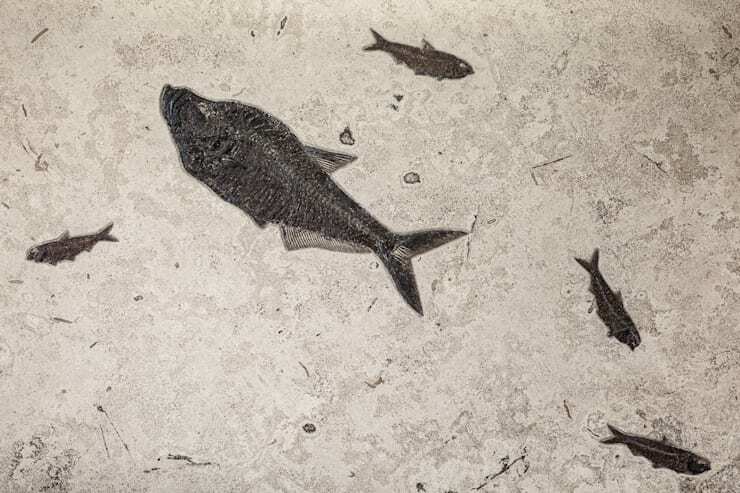 Our client had chosen Sandstone that was 50 million years old, with fossilised fish decorating each piece. If you think Sub Zero fridge/freezers are extravagent, think again. The result of our clients vision, the detail that went into the design and all the hard work our team of craftsmen put into the project, we think, is quite stunning. The pictures do not tell the whole story, nor do they convey the beauty of the materials and finishes, you have to see them up close to appreciate the work that went into creating each piece. It is, one of a kind in this country. This is what we do for a living and we love it. We hope you do too. ["VE"] [Published] 8 Cocinas rústicas espectaculares ¡Con mil ideas para copiar! ["AR"] ¿Cómo elegir la isla de tu cocina ideal? ["AR"] [Published] 7 Bachas de cocinas modernas ¡Pero con un toque rústico! ["NL"] [Published] 17 meestvoorkomende inrichtingsfouten! 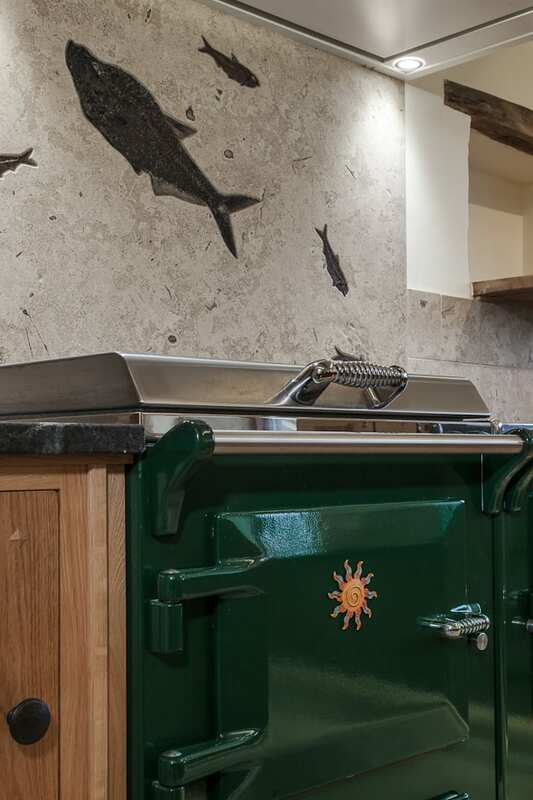 A close up of the Sandstone backsplash with a large, combi honed Diplomystus fossil fish, behind the Everhot range cooker. The honing, reveals the bone structure of the 50 million year old fish, allowing you to run your fingers along its spine. This is one of two identical sinks commisioned by our client, one for the kitchen, the other for the utility room. 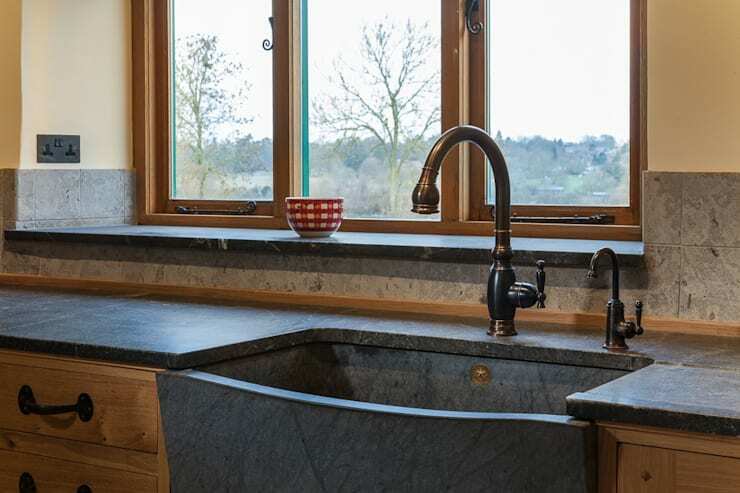 the sinks were carved from solid blocks of stone, with a scooped and drop front apron. The wastes and taps were from the USA, with bespoke plumbing fittings made in the UK to make them fit UK pipe work. 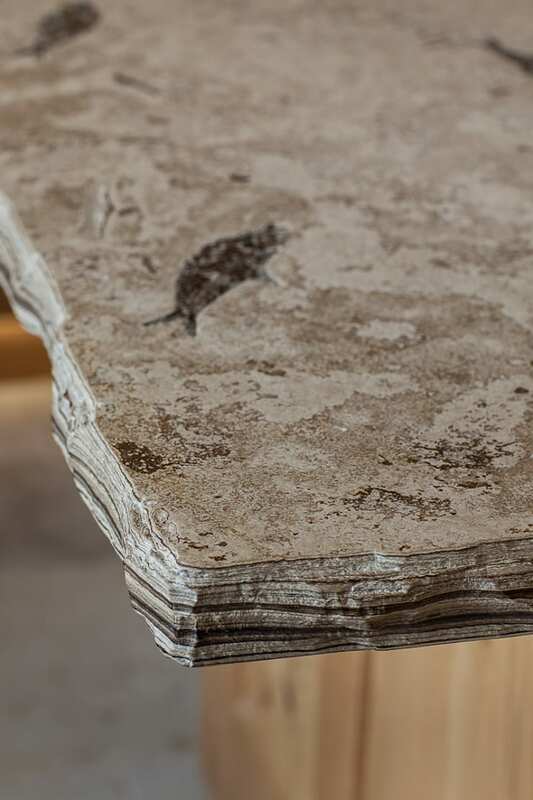 The island unit was crafted from solid oak and supports the fossilised sandstone work top. 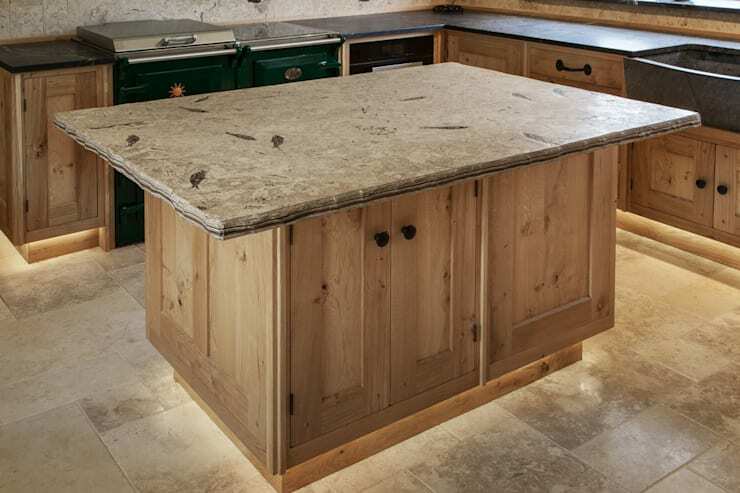 LED lighting makes the island unit look like it is floating above the Limestone tiled floor.